Last September, concertgoers in Riga, Latvia, were treated to a choral and orchestral performance that included a suite from Fiddler on the Roof, including Sunrise, Sunset, Anatevka, and If I Were a Rich Man. 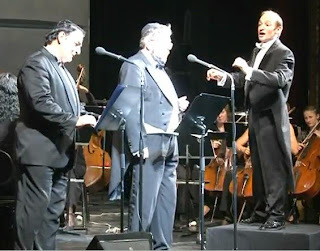 Sung by soloists Zev Shulman and Gia Beshitaishvily with the Moscow Male Jewish Choir, Hasidic Cappella, and an orchestra conducted by Alexander Tsaliuk, the performance seems specially fitting because it was held so close to where pogroms took place all over Russia and Eastern Europe around 1905, the year in which the Jerry Bock and Sheldon Harnick play was set. Hasidic Cappella is Russia's leading Jewish a cappella choral ensemble. The choir’s singers are all professional musicians – students and teachers at Moscow Tchaikovsky State Conservatory and other leading musical institutes in the capital – who have performed in the city’s most acclaimed choral groups. They are united by their commitment to introducing listeners to the beauty of Jewish liturgical and cantorial music -- music that has been forgotten and remains unknown to even the most educated lovers of music. The choir’s extensive repertory includes Jewish liturgical music, songs in Yiddish and Hebrew, Russian folk songs, and classics of world music. The choir is one of the few recognized professional Jewish academic musical groups in the world and the only one in Russia. So click on the image below and enjoy the performance.